Spiritoons! - World's First 'Non-Serious' Spiritual Cartoon Blog: The Obvious! 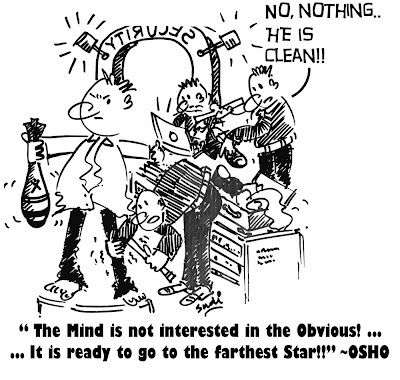 "the mind is not interested in the obvious. The mind is not excited by the simple, because deep down mind is nothing but your ego, and the nourishment of the ego comes from the challenge of the far away. The more arduous, the more torturous, the more difficult an achievement is, the more the mind becomes fascinated. It is ready to go to the farthest star, not even bothering what it is going to get there; that is irrelevant." ~ Book: Om Mani Padme Hum , OSHO.